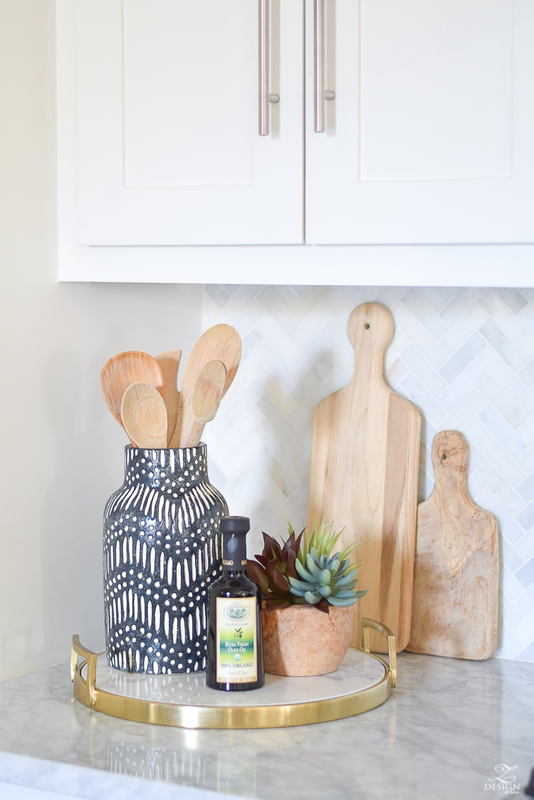 My all time top post is 3 Simple Tips For Styling Your Kitchen Island and since you guys have given it so much love I thought I would come back with a post on 9 Simple Tips for Styling Your Kitchen Counters. 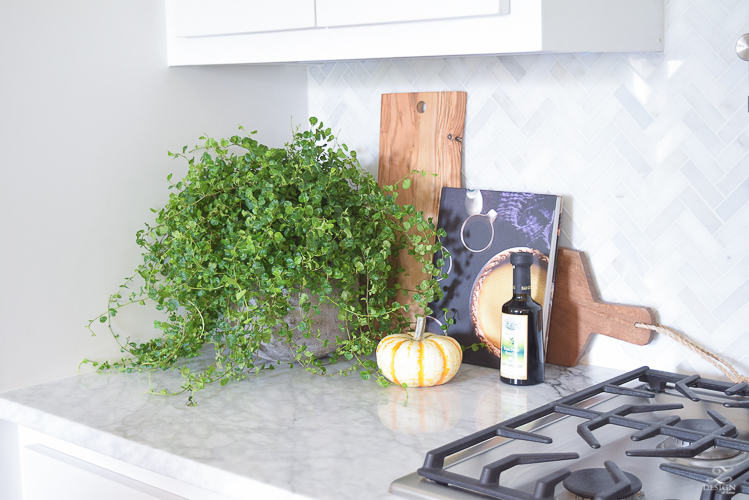 Everyone may not have an island but most of us have kitchen counters so I hope this post is useful in helping you to get those kitchen counters styled up pretty! 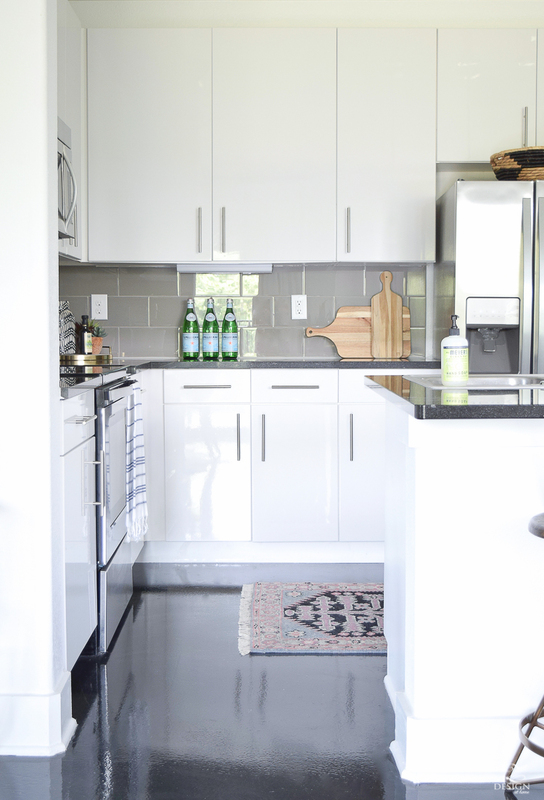 If you missed it, you can get caught up HERE on my post on styling the kitchen island. There are actually two components to this design dilemma therefore I’ve broken this post down into two groups of tips. 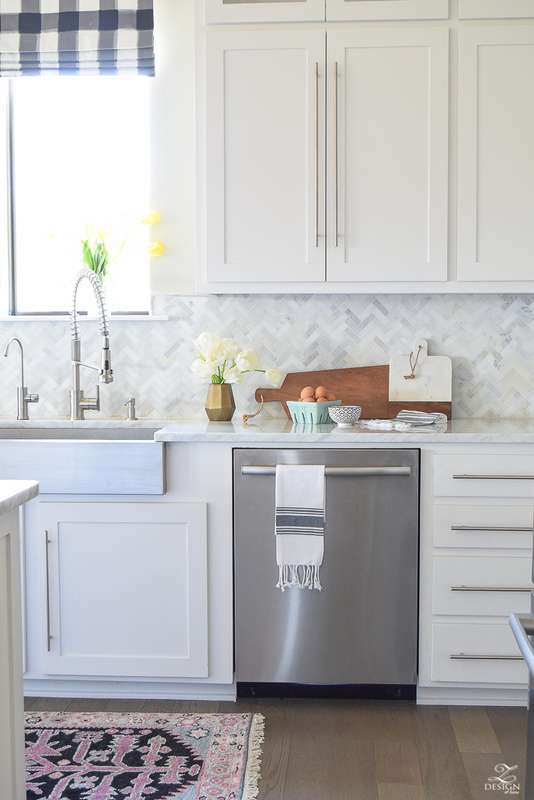 The first group is some ideas for items that you will want to use to style your kitchen counters and the second group will be a few simple tips on the details or method of how you will style your accessories on your counters. Of course this is not an exhaustive list but is a list of most of the items I like to use to style my own countertops with. 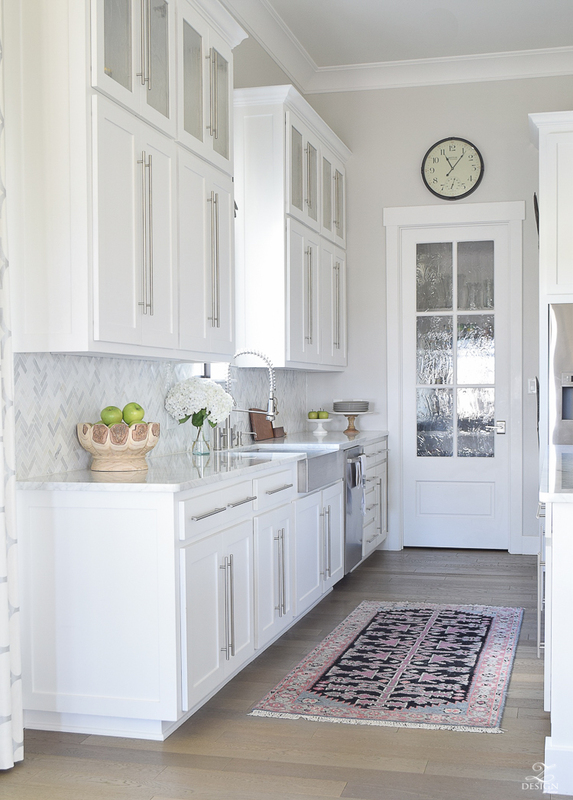 This look creates visual drama, draws your eye in, and gives you a place to display dishes, fruit, or other things or collections you like to see in your kitchen. 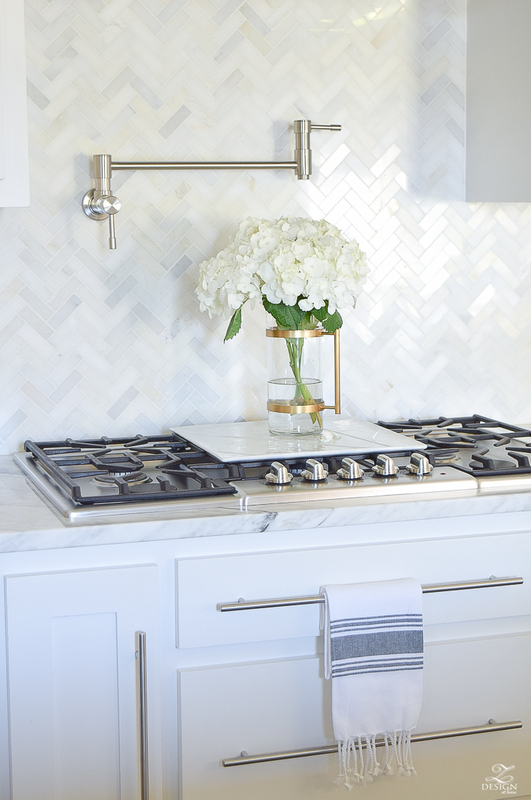 This is one of my favorite ways to style the kitchen counters. 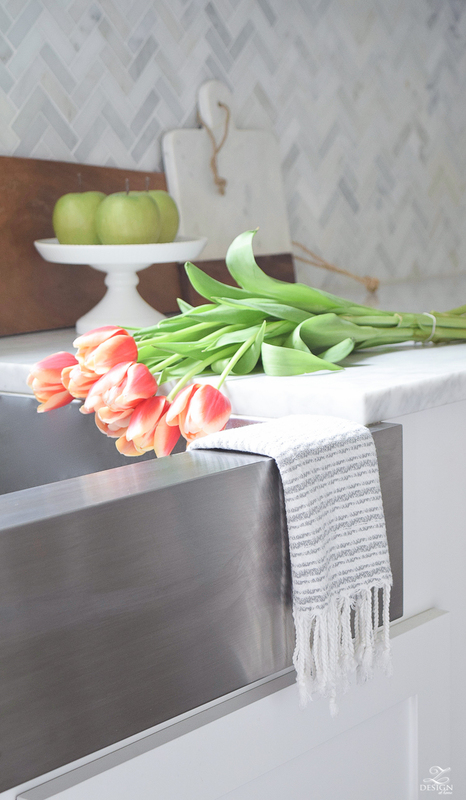 This brings a lot of vibrancy and personality to your space, not to mention it makes your counters literally come to life. This design tip may be a bit over used but, if it’s true anywhere it’s truest in the kitchen! 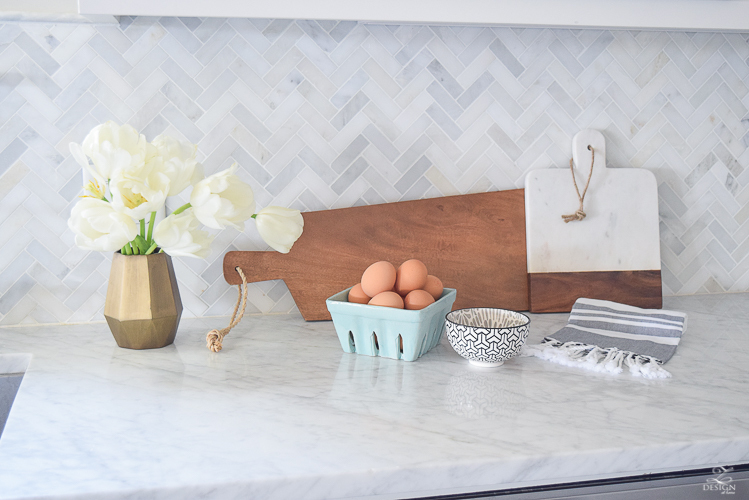 This can be a pretty way to display essentials that you want to leave out all of the time for convenience but still want them to look pretty and like they belong in the space without cluttering up your countertops. In design I love using items for a dual purpose and/or for reasons they weren’t meant for. In the 1st photo below I used a flower pot for a utensil holder and in the second photo I used a vase for a utensil holder. 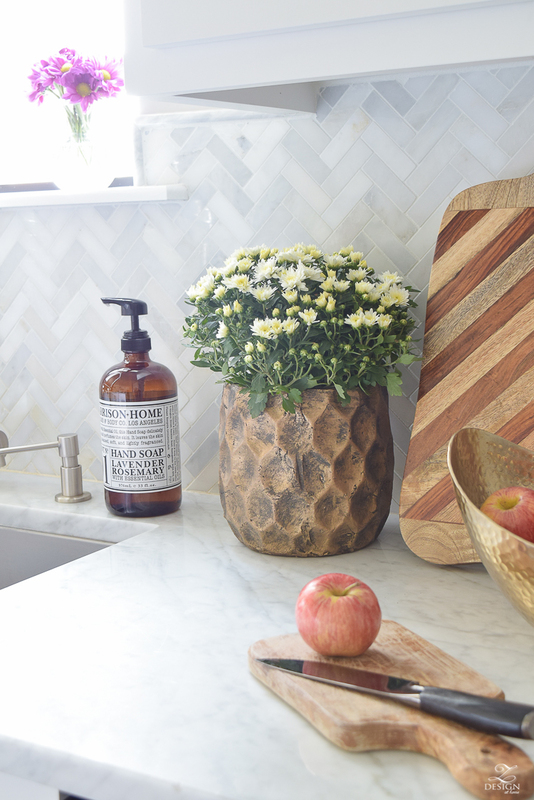 Both work great for my intended purpose and both add color, texture, and character to my counter tops. 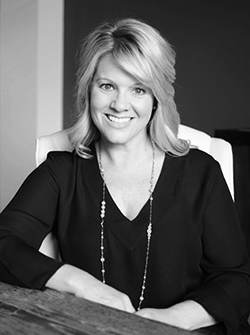 Use them in odd numbers or use them alone but this particular item can create a big impact. 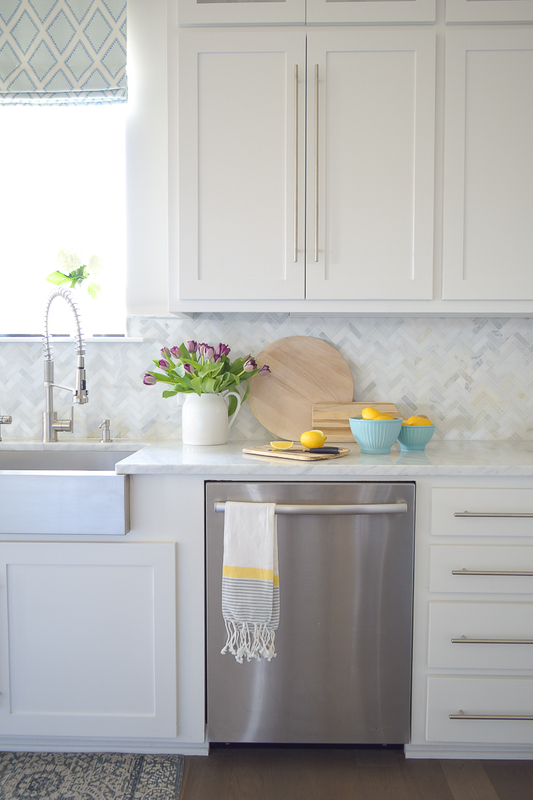 It’s fresh and modern and can make your countertop and backsplash pop with color! Here I included a cutting board to place them on for added visual impact. 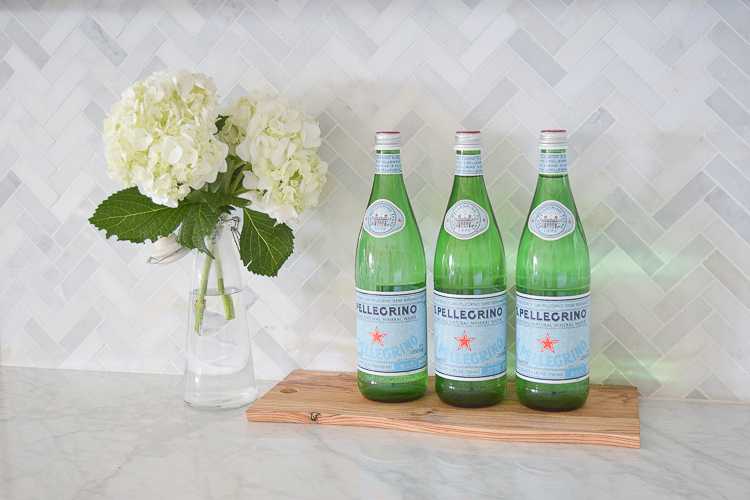 Here is a peek at my rental kitchen and one of the first things I used to style the counters when we moved in were these S. Pellegrino water bottles (like literally the 1st day:). 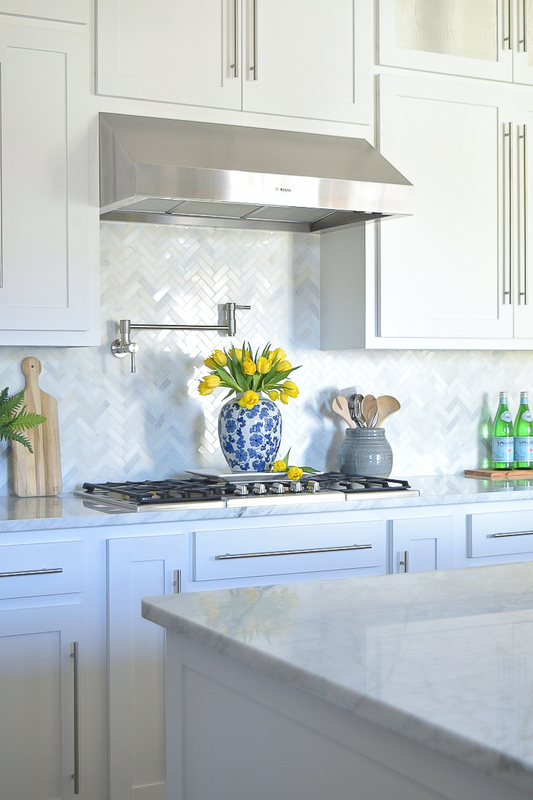 They go along with the modern theme of this kitchen and add a splash of color to break up the black and gray, which I love. Typically you will see a beverage in a pitcher, right?! 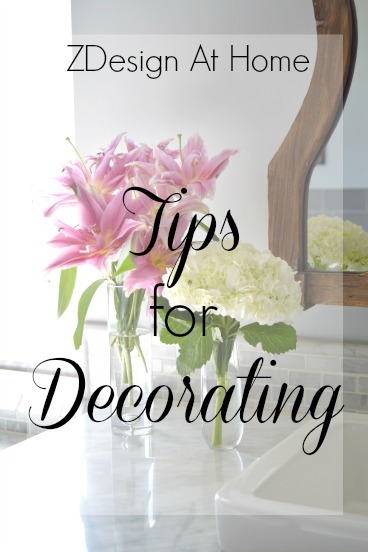 So, using one for flowers is unexpected and such a great way to display your flowers or other items, even utensils like we talked about above in tip #4. 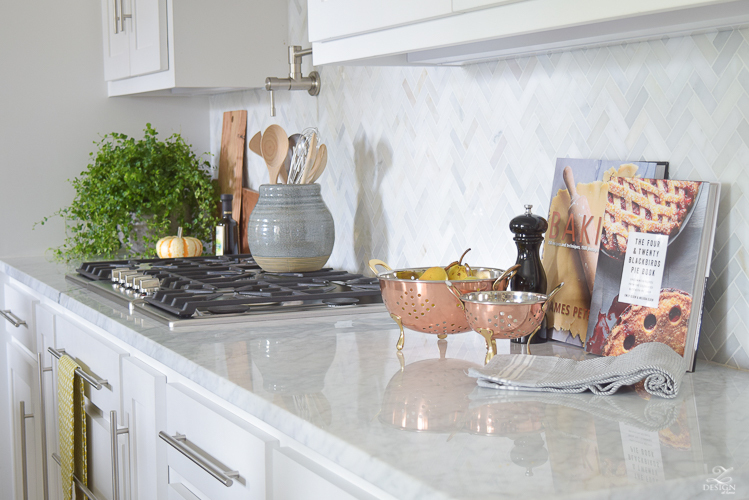 Cutting boards are my absolute favorite thing to decorate with in the kitchen but cook books are fun as well and art is an unexpected choice against a kitchen backsplash that always grabs my attention. 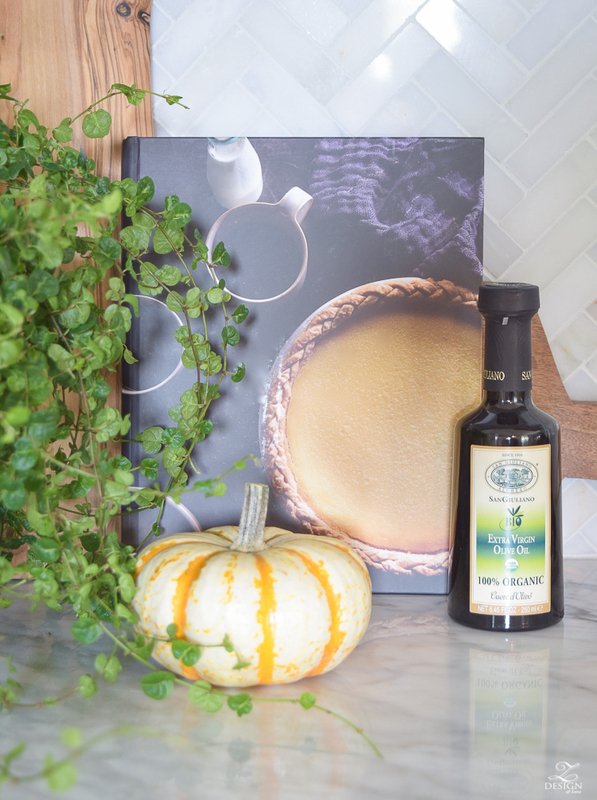 Additionally, putting a large cook book on a stand can have a dramatic affect that of course works beautifully in the kitchen. 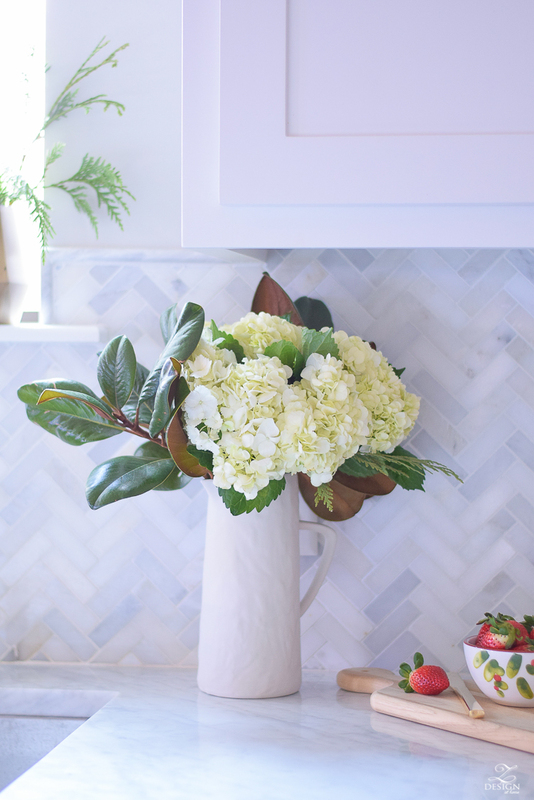 Use organic items such as branches, flowers, and fruit to make your vignettes come to life. 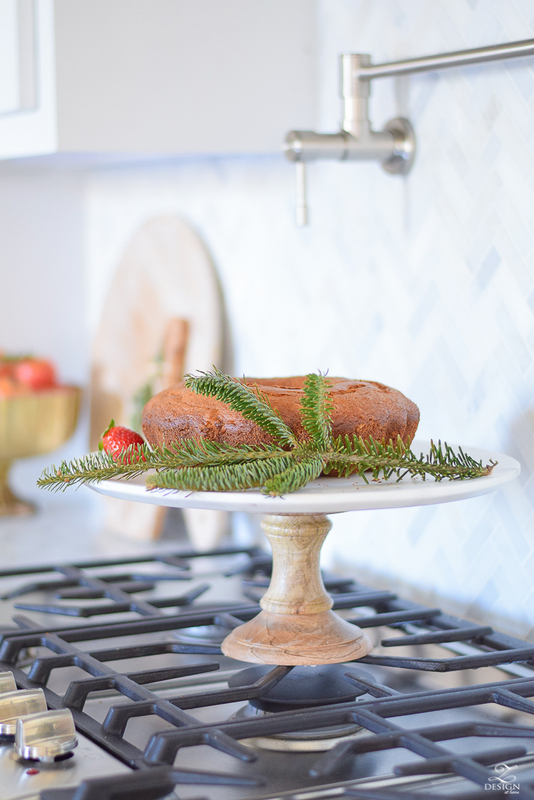 Adding some greenery and of course fruit anywhere in the kitchen is an invitation to eat healthy and will add a pop of color in the process. 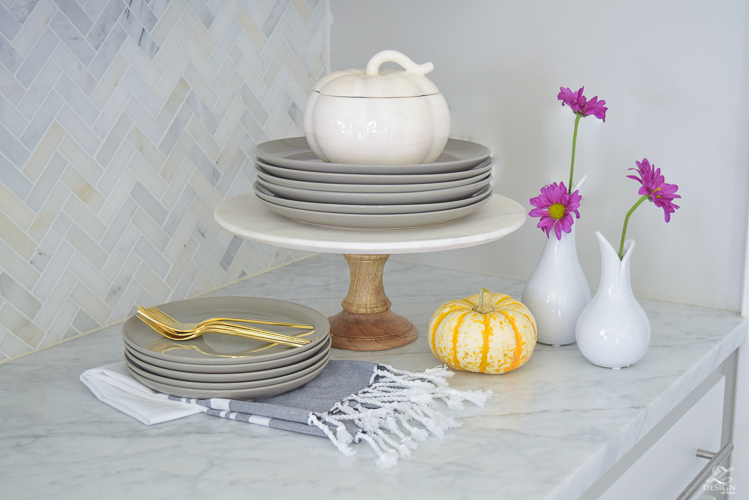 And last but not least…always, always use pretty dish towels! 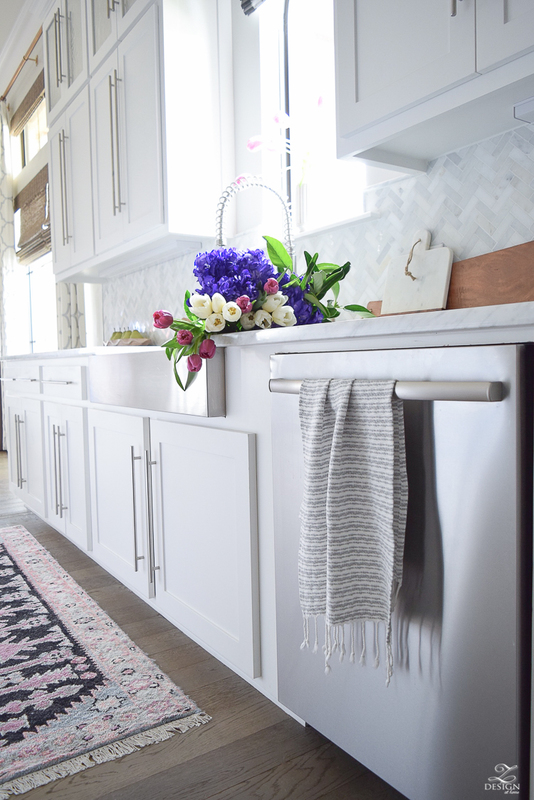 Nothing says pretty kitchen styling like a hand towel with fringe! 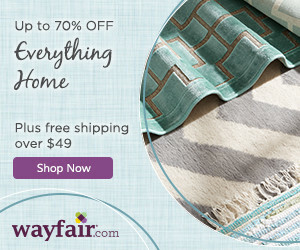 A nice dish towel brings a soft touch to the kitchen where most surfaces are hard and the fringe adds a whimsical touch. I promise (like black shoes) you can never have too many pretty towels with fringe:)! 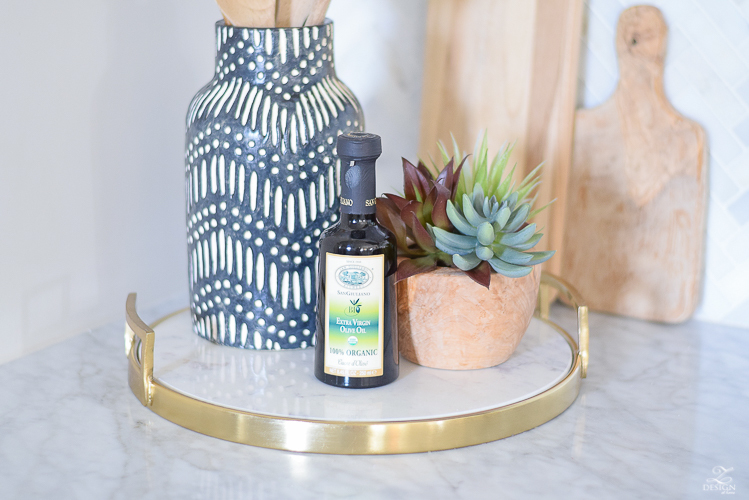 Now that we’ve covered some items to use in styling your kitchen counters, here are a few more tips to always remember when styling your counters, consoles, coffee tables or other surfaces. I have a full post HERE on Shelf and Console Table Styling 101 with tips for the beginner stylist. 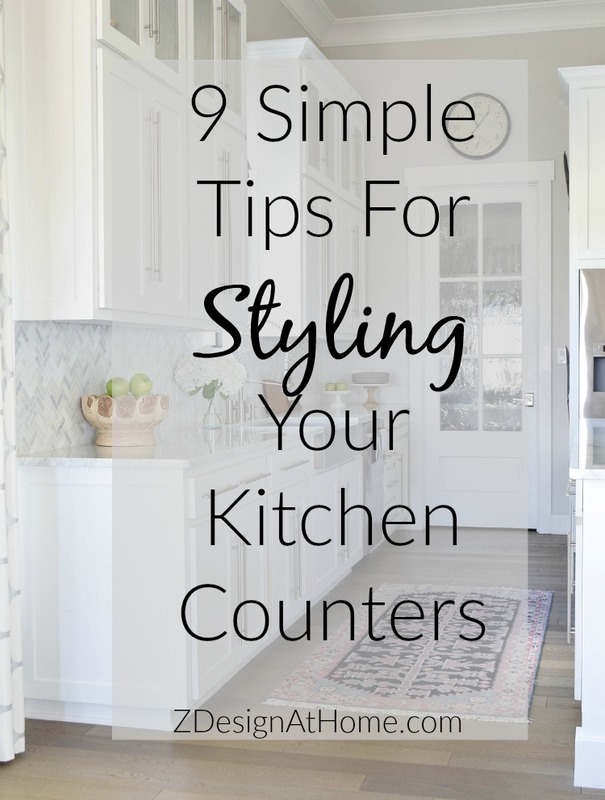 I hope you’ve enjoyed this post on 9 Simple Tips For Styling Your Kitchen Counters and thank you for stopping in today! If you have not yet signed up to get weekly updates (only once per week!) to alert you of new posts, you can do that HERE! 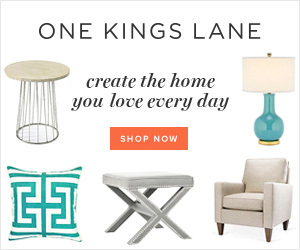 « Finally Home Project: Inspiration Photos & Breaking Ground?! Great post! 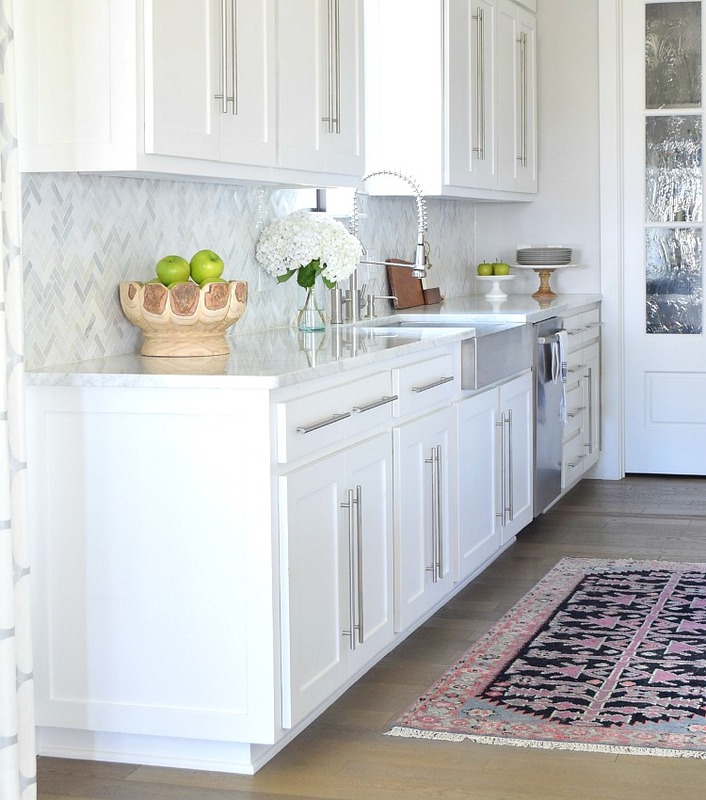 I am curious if you will be using Marble countertops in your new build, after living with them in your last house. Thoughts? 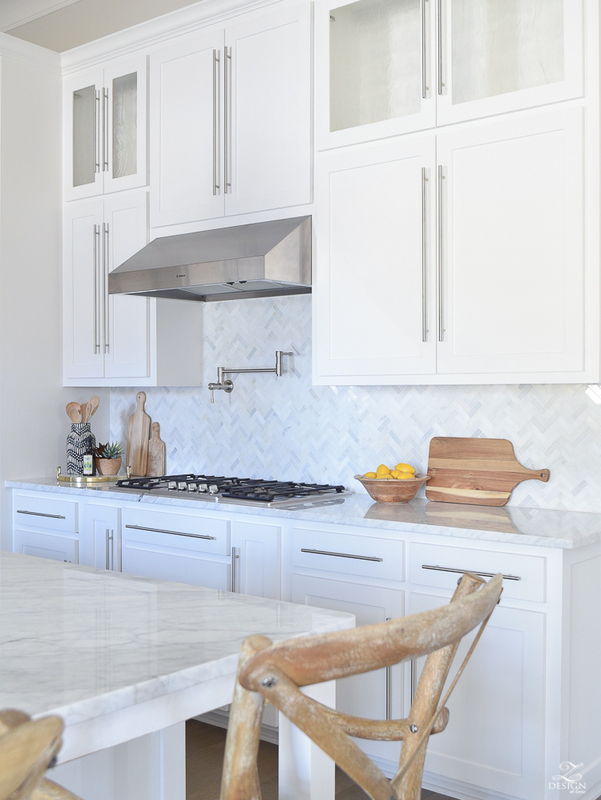 My current thought is to do my island in marble but do something hardier on the perimeter, like a solid-color Caesarstone quartz. Can’t beat the look of marble, though!